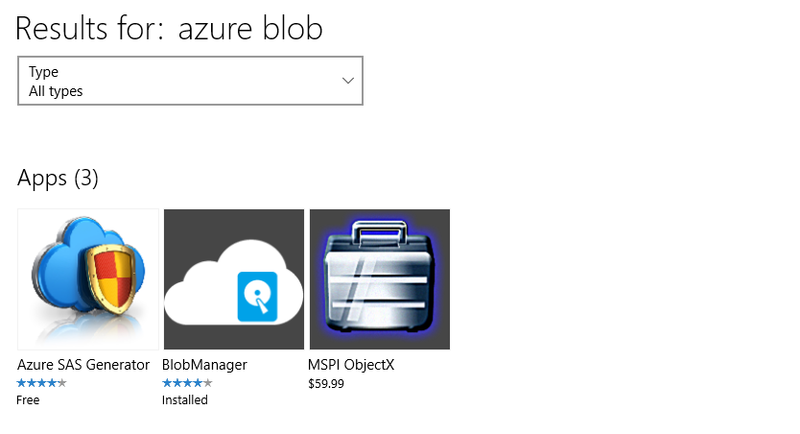 I use Azure Blob Storage a lot and the number of high-quality, reliable tools that allow you to perform basic tasks within your Blob Storage account are few and far between. ClumsyLeaf CloudXplorer: This is a great tool but comes with a price tag. The price tag used to be somewhat reasonable ($19.99) but now its $59.99! I guess maybe its because the developer added support for a whole bunch of other storage platforms. Azure Storage Explorer: Old faithful. This thing has been around for ages and it does all three storage types (Blob, Table, Queue) and it’s free. The UI is a bit clunky and it appears to be abandoned. One blaring omission from my list are any native Windows application. You would think there would be dozens, right? The only application that remotely appears to attempt to do the job is “BlobManager” but it appears to only allow you to use a single Storage Account and be written using the Windows 8.x SDK so very likely not maintained any longer. I wish there was a native Windows 10 application that was simple, clean, supported multiple accounts, and performed a small set of basic operations reliably. ← Amazon Dash Buttons are really cool!